Each month, we publish an update on our family’s net worth here on The Money Sprout. Tracking our net worth helps my family stay focused with our personal finances. In order to follow our path to financial independence (FI) … my wife and I have chosen to focus on growing our net worth. This includes growing our income from side hustles (hopefully passive) while keeping our monthly expenses low. Almost every single time we report … our net worth usually grows. Every once in a while we will see a slight dip in our net worth … but over the long term it is a constant and steady path up. We published our first net worth report 3.5 years ago and have seen it grow by over $200,000! Here is our latest monthly net worth update. Before we move on to reviewing our August net worth numbers, I would like to mention how we are using our Personal Capital account to do most of the work. So how did we do this August? 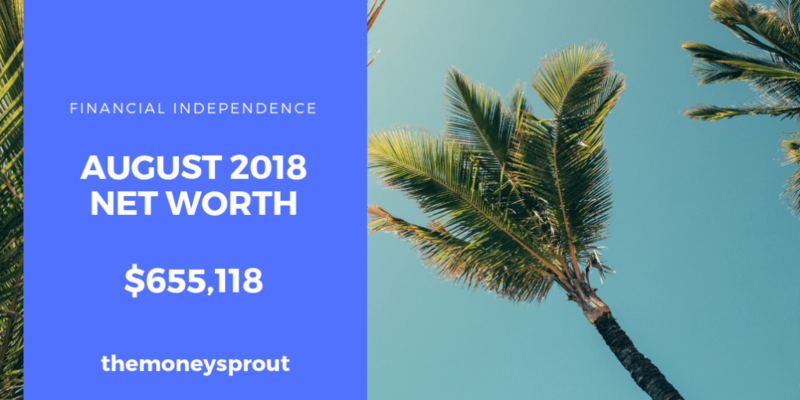 As of August 31st, 2018 – our net worth is $655,118. That is a huge increase of almost $20,000+ in net worth in one month. As a result of these increases, this is the highest our net worth has ever reached and we hope to continue this trend through 2018. We managed to pay down some debt last month … which was a good thing. And our assets increased … which is always fun to see. Our net worth in August 2018 increased by 3.04% compared to July. We always report our net worth with 3 main asset categories that include – investments, cash, and home value. Note – We currently do not count our automobiles as an asset and they are only found in the liability section of our reports. Below you will find a breakdown of each category for last months checkup. Our investment category includes a dividend income portfolio, 529 plans for the kids, 457 account, emergency fund accounts, IRA accounts, Roth accounts, and any other retirement account we have opened, etc. We have been building these assets for the past 10 to 15 years (depending on the account). These equity investments are currently (and likely will always be) our highest valued asset. There isn’t a day that passes that we are not working to make this asset grow … despite what the overall market is doing. During August our investments saw a large increase compared to last month. Overall … our investment assets rose by over $20,000+ in August compared to July. That is an incredible 4.1% gain in value of our investments in just one month! This was on top of the 3% we saw last month. The majority of these gains were from increases in the stock market. Our cash balance increased by over $2,500. This increase will be used to pay off our higher short term credit card debt (see below). Note – When it comes to cash … I find it a very inefficient way to build wealth. That is why we put it to good use whenever we can. Reporting home value in our net worth reports is good and bad. For example, we use Zillow to estimate on our home value. This is simply an estimate at best and may not represent the actual value we could sell our home for. That is the bad part of reporting it on our net worth. On the other hand, it is such a huge asset that not reporting it would skew our net worth results. We currently owe about 50% (maybe a little more) of the value of the home. That is a significant part of our overall net worth in my opinion. The estimated value of our home dropped this past month compared to July. This was the second month in a row our estimated home value dropped by over $2,000. Last month was a $4,000+ decrease. Again … these are just estimates of our home value and nothing I will get that concerned about. Our biggest asset class (stocks) rose by over $20,000 last month. The cash balance we carry increased by over $2,000 and our estimated home value declined by another $2,000. Overall our total assets rose by just 2.5% since last reporting … which is a nice jump in one month. Overall this was a very successful month for growing our assets … despite seeing our home value drop so much. The last category is our car loan(s). We plan to have one of our vehicles paid off completely by next summer. The other vehicle is a 0% loan … so we are in no rush to pay extra on that one. We have a 30 year mortgage on our home with a rate of 4.375%. Most months we try and throw a little bit extra money at our principal … but not as much as I’d like. If we could go back about 10 years, my wife and I would have purchased a much smaller home. We made a mistake and bought a home that was too big. We could have easily raised our 3 kids in a house that was 1,000 less square foot than what we have now. That move alone would have saved us thousands and thousands of dollars every year. Over the past several months, we have been considering downsizing our home to something smaller and less expensive. We are continuing to look for smaller homes in our area … but it seems that the housing market is booming so homes don’t stay on the market for very long. For now … we will continue to just pay our mortgage every month and watch the principal shrink little by little. Each month we make a mortgage payment, our principal drops by a little bit more each month. This past month we got a boost by adding another $121 to our payment. At the start of last year (January 2017), we took on a lot more debt after buying a second car … which I will refer to as “car loan #2”. My 16+ year old Saturn SL1 finally died, so I needed reliable transportation. I fully expect to drive this car for 15 years or eventually sell it to my oldest son when he starts to drive. Despite having a low 1.56% interest rate on this loan, we recently started paying down some of the balance. I know the returns in the stock market would have been much larger … but the thought of paying off this debt makes me smile. During August … we saw a nice drop in debt on both of our auto loans. As noted earlier, we are now paying down the principal on this loan and hope to have it all paid off very soon. This will help our net worth grow. In total, our car loans pushed our net worth higher by over $800! Normally, our credit card spending is the biggest area for improvement when it comes to debt. We never (ever) let our credit card payments slip past their due date. Paying interest or late fee’s is a complete waste of assets. Our credit card balances fluctuate a lot month to month. During this past month’s snapshot, we had a lot more in short-term credit card debt. We had a lot of expenses from multiple summer vacation trips along with a bunch of school related expenses for the kids. I expect our credit card balance(s) to come down over the next couple of months and then begin to climb again towards Christmas and the holidays. One of the things I absolutely lover about credit cards are the travel rewards we are starting to bank. Check out our Travel Rewards page for up-to-date information on our pursuit for FREE Travel. Now into 1 full year of our credit card journey, we have banked over $10,000 in future free travel! Since last reporting, our mortgage balance dropped a nice chunk … as expected. We also saw a nice dip in car loan debt, which was also expected. Our credit card balances rose considerably from last month. This short term debt (that will be paid off in full) was a result of summer vacations and an increase in spending getting ready for school for our 3 kids. Collectively our total liabilities rose by over $1,250+. Even though our liabilities increased last month … I am not all that concerned. Both of our longer term debts (mortgage & auto) declined by a good number. It was our shorter term debt (credit cards) that increased and will be paid off using that extra cash listed above. We plan to keep these net worth posts updated every month now. Not only does it keep us accountable in how we save, earn, and invest … it is great motivation when you see growth like we have over the past 3+ years. For example, our first ever net worth report was posted back in March 2015 … almost 3.5 years ago. We reported a net worth of $434,984 back then. Now we are over $650,000 in new worth … which is a sizable increase in less than 4 years. We also realize the huge gains in the stock market have helped us grow our net worth. Looking out into the future … my wife and I have a FI Number somewhere between 1.25 and 1.50 million dollars. So we are $600,000 to $900,000 away from that goal … which means we are getting close to 50% of the way. If it were possible to repeat the past 4 years, then we could reasonably hit our FI target within the next decade. Do you track your net worth? How did your August net worth totals turn out? What steps are you taking to widen the gap between your assets and liabilities?